Vegetarian sausage “Pumpkin” . Premium boiled | Компания «Вегановъ» – вегетарианские продукты питания. Ingredients: wheat protein (Russia), pumpkin, extra-first cold pressed olive oil (Greece), first cold pressed Virgino colza oil (Finnland), sunflower oil (Krasnodar), extracts and spices: red paprica, oregano, kumin, chilli, thyme, clary sage, sea salt, seaweed polysaccharides, inulin from chicory, natural dye “paprica”, carrot fiber. 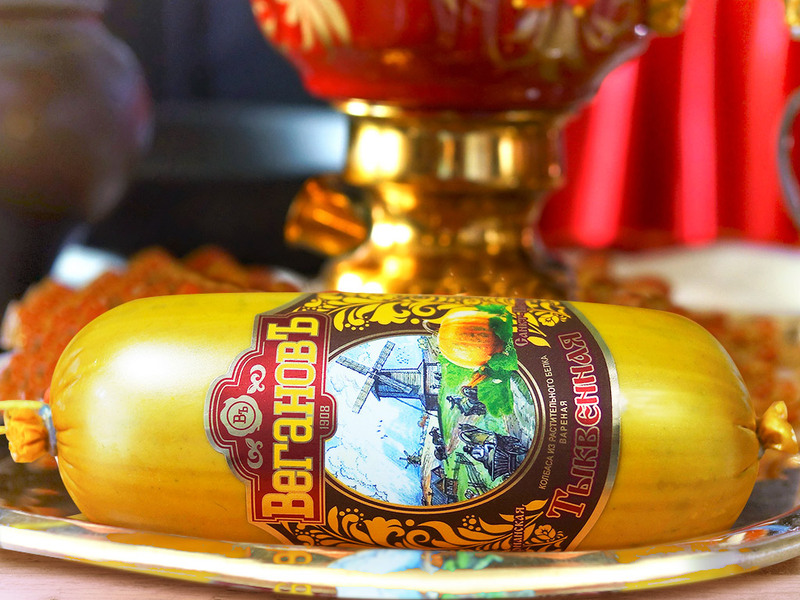 The product has received the gold medal in the tasting competition “Innovative Product” on international exhibition “PRODEXPO 2015”. The sun appears in the sky less and less when fall comes, and where do you think it goes? Ancient people believed that gods were hiding the sun in the pumpkin, because a pumpkin becomes golden right by this time. There’re many legends about this plant. According to the biblical legend, God raised a pumpkin for Jonah per night. And ancient Greeks called a pumpkin as a goddes – Kolokassiya. By Christians pumpkin is associated with the resurrection, the awakening of his creative powers. Pumpkin is a kind of natural vitamin-mineral complex. The pumpkin has sugar, carotene, vitamins C, B1, B2, B5, B6, E, PP, and very rare vitamin T, that helps to speed up the metabolic processes in the body, blood clotting and platelet production, vitamin K, fats, proteins, carbohydrates, cellulose , pectin, minerals, including potassium, calcium, and iron. There’s more carotene in a pumpkin than in a carrot. Therefore, ophthalmologists recommend to eat more pumpkin to people, who has blurred vision. An orange pumpkin deserves the title of champion among all existing vegetables according to the content of iron , for this reason it is recommended for those, who suffer from anemia. Pectin, found in pumpkin in large quantities, promote the excretion of toxic substances and cholesterol. Due to the high potassium content a pumpkin improves heart, strengthens blood vessels and relieves the swelling.